When the penal colony of New South Wales was founded no preparations were made for a currency. The first fleet came with some money to procure supplies during the journey. The convicts were not paid anything and the soldiers were supplied with goods free from the Government store. During the early days of the settlement every one depended on rations. Most of the first coins came from the officers, sailors and convicts. Once the colony started flourishing, a system of bartering was taking place. Soon the colony started trading in promissory notes, land and rum. By then, the officers of the New South Wales Corps through corruption and subversion became influential and wealthy and controlled most of the money dealings in the colony. The workers were being paid in Rum and the colony has fallen into a state of alcoholism and drunkenness. Major-General Lachlan Macquarie who served as the fifth and last autocratic Governor of New South Wales from 1810 to 1821, is considered as a visionary and a reformer. Until his appointment, the normal practise was to appoint naval officers as Governor of the newly established colony. Macquarie was an army commander and he was appointed in the hope that he could secure the co-operation of the unruly New South Wales Corps. To control them Rum needed to be replaced with a legitimate currency. When Governor Macquarie arrived in Australia. The colony suffered lack of coinage particularly because trading vessels took coins out of the colony in exchange for their cargo. Due to the shortage of currency, the real currency in Australia during the first twenty-five years of settlement was Rum. Governor Lachlan Macquarie had to address this issue when he took charge of the Colony of NSW in 1810. Before going into the NSW’s issue of coinage, our readers need to have a glimpse of the history of European system of currency during that period. From 1497, the Spanish government started to mint a large silver coin which became known as the Spanish dollar. Most European countries including Great Britain was suffering from coin shortage during that period. The British capturing the Spanish Territories in North America resulted in the gain of Spanish Dollars to the British. To deal with the currency shortage, in 1704 Britain’s Queen Anne proclaimed that captured Spanish dollars were officially acceptable currency in her North American colonies. In 1811, to prevent the re exportation of Spanish dollars, the British permitted the circulation of both a ‘cut dollar’ and the centre, or dump, from the cut dollar. This cut dollar was to become known as the holey dollar: it was valued at nine shillings, and the dump at one shilling in North America. Macquarie took a clue from it to solve NSW’s coin shortage. On 26 November 1812, HMS Samarang from Madras, brought in 40000 Spanish Dollars for the purpose, which was valued at £10,000. The centres of the coins were punched out. 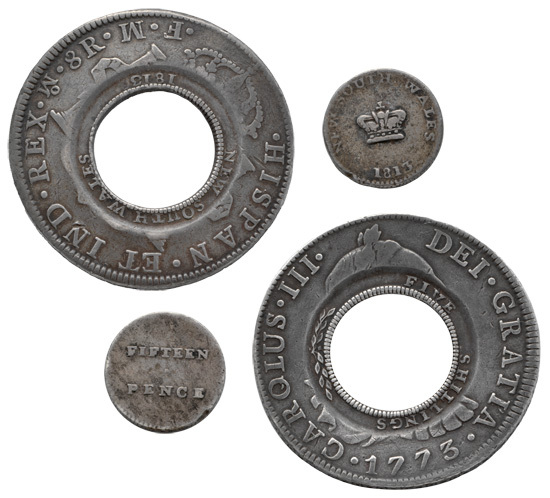 The punched centre, known as the “dump”, was valued at 15 pence, and the outer rim, known as the “holey dollar”, was worth five shillings. Holey Dollar was 37mm diameter and Dump 19mm diameter. By making it two coins it increased the worth of the coin by 25 per cent. William Hanshall, a convict transported for forgery, carried out the work for the Government. These two coins were over stamped. For the Holey Dollar, original Spanish details were remaining on both sides, and the inner circle edges are over stamped with Australian markings On the upper Part of one Side was impressed at its inner Rim the Words “Five Shillings,” and at the lower Part of the Rim, on the same Side, is also impressed the Figure of a Branch of Laurel, and on the reverse Side , at the upper Part of the said inner Rim, are impressed the Words “New South Wales,” and at the lower Part of the same Rim, the Figures “1813” the Edges of the said inner Rim being grained on both Sides. The new currency was proclaimed in the Sydney Gazette of 10 July 1813, with offences of forgery, utterance or exportation of the new currency being punishable by seven years in the Newcastle coal mines. Government started recalling and replacing the coins from 1822. They were in use until 1825 when the British Parliament passed the Sterling Silver Money Act. This act made only British coins the recognised form of currency and ended the legitimate use of the holey dollar and dump in Australia.